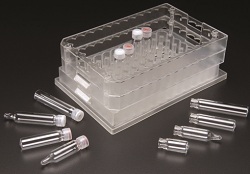 COMBINING the benefits of individual sample vials with the handling advantages of the standard 96-well microplate format, JG Finneran’s new Snap Seal Vials and Snap Top Caps may appeal to many laboratories. It's vials, it's a microplate, it's a vialoplate! An adaptation of the company’s existing vials and caps system enables these to be multiplexed in a multi-tier microplate and so become compatible with lab automation systems. The glass vials with snap-tops are secure and solvent-resistant, says Finneran, and offer better flexibility than conventional plasticmicroplates. The vials have an outer diameter of 9mm and are available in three sizes – 0.5ml, 0.75ml, and 1.0ml – with a conical or tapered profile to enable liquid handlers to access volumes as low as 10ul. The vials are strengthened around the cap to resist breakage during the vulnerable capping and uncapping operations, while the caps are available with septa of PTFE, silicone, or butyl rubber. No crimping or decapping tools are needed, and sealed caps protect samples from cross contamination or evaporation. Finneran describes its Multi-Tier Micro Plate as an improvement over conventional 96-well microplates for having a vented base plate to improve uniformity of heat transfer during heating and cooling in a water bath.